582p. (Defining Documents in American History). bibliog. chron. index. photos. websites. Salem. Nov. 2018. Tr $295. ISBN 9781682176986. Gr 10 Up—Extending the "Defining Documents" series, these volumes offer evidence of transgressive misrepresentation, betrayal, corruption, misbehavior, concealment, and other failures of government ethics and openness, in 74 documents from 1797 to 2018. 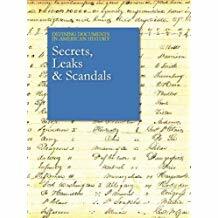 Grouped chronologically in six sections (and reordered in a final time line), the entries examine political, social, foreign, and domestic scandals; espionage; controversies; hacking and leaking; environmental malfeasance; and more. Section overviews, chapter bibliographies, extensive web and general bibliographies, and an index are valuable. Shally-Jensen and 20 scholar contributors critically dissect each primary source document (sometimes edited for concision). Incisive critiques illuminate these key cases: Benedict Arnold's treason, the Chennault affair, Watergate, My Lai, and more. The past 60 years alone fill the entire second volume: President Ronald Reagan on the Iran-Contra scandal, intelligence on Iraq's supposed weapons of mass destruction, birtherism, Wikileaks, the 2018 policy on child separations at the U.S.-Mexico border, and much more. Tension between state security and transparency continues to be an issue, and the evenhanded close readings of these riveting historical cases clarify some risks and costs.